City Hall would have to be one of the most historic buildings in my home city of Brisbane, Australia. Constructed of tan sandstone and opened in 1930, the entrance features a colonnade of Greek design, elaborate bronze doors and carvings of lions’ heads. 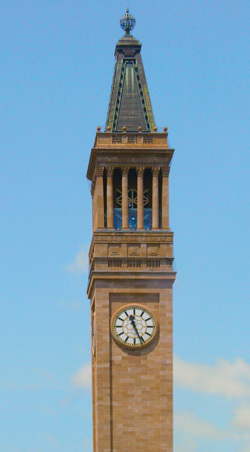 High in the clock tower, modelled after the St Mark’s Campanile in Venice, Italy, tourists have a great view of the city. The large circular auditorium, reminiscent of the Pantheon in Rome with an expansive copper dome, can seat up to 2,500 people. Unfortunately, the foundation of this iconic building is failing. It was built on swampy ground and has serious problems including rising damp, concrete cancer, lack of reinforcing, and subsidence. In January 2010, the City Hall was closed for three years for critical restoration work. The price tag is $215 million. The alternative was for it to be bulldozed. Tourists did not visit the City Hall to view its foundations. Rather, they admired the architecture and carvings, and visited the clock tower. They took it for granted that the foundations were solid. But now that the problem has emerged, special attention is fixed on the foundation. 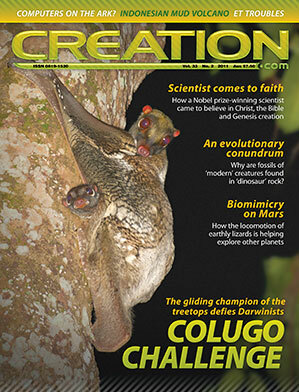 The importance of good foundations is why Creation magazine focuses on the scientific evidence for biblical creation. Creation is foundational to our lives, but there are serious problems with the foundation of society today. The rising damp of scientific naturalism is eroding it, the cancer of goo-to-you evolution is making it crumble, and academic institutions ignoring the true history of Genesis are deepening the swamp. Urgent attention must be focused on the creation foundation. The creation/evolution issue affects every aspect of life. The creation/evolution issue affects every aspect of life. Human life is valuable because humans are made in the image of God. We did not evolve from animals. Charles Darwin claimed blacks are less evolved and less human than whites, an idea that gave slavery the ultimate in ‘scientific’ justification (pp. 44–46). Yet the scientific evidence increasingly supports biblical creation. When the chimpanzee Y chromosome was sequenced recently, it revealed a great divergence from the human sequence—a shock for evolutionists but consistent with creation (p. 56). Creation is based on evidence. When we see a painting we know there was a painter. Likewise, when we study the creation we see the evidence for the Creator—design. Creation magazine regularly features evidence of design and in this issue we showcase the remarkable design in ant hills (pp. 36–38). Also, we report amazing glue that spiders use in their webs that is helping scientists design adhesives for biomedical applications (pp. 34–35). But the Genesis foundation is even bigger. Like reinforcing in concrete, it includes all the major events of biblical history, and one of the biggest is the Genesis Flood. All over the world, we see the evidence for this global catastrophe—but we must know what to look for. Evidence such as thousands of dinosaur footprints discovered in sedimentary rocks in China (p. 47), living fossils uncovered in museum collections (pp. 20–23) and the global distribution of animals (pp. 54–55). Yes, creation is foundational. On a personal level, when we have a solid confidence that God created as Genesis says, it gives us a firm basis for a fulfilled and empowered life. We know where we fit into the world. We understand what makes a successful family and a happy marriage. And we appreciate the Gospel of Jesus Christ revealed in the New Testament (pp. 16–19), which gives us the answer to our biggest need. When the creation foundation is in place we can build a fulfilling, fruitful life.